Eastern Pennsylvania Youth Soccer will celebrate the 2018 year in soccer at the Annual Awards Banquet on Friday, February 22, 2019. In anticipation of the event, which will take place at the Sheraton Valley Forge, we'll profile honorees each day leading into the Awards Banquet. First up: D'Anjolell Award (Club of the Year) winner, Rose Tree Soccer Club. For more than 50 years, Rose Tree Soccer Club has provided quality programs for the families of Media and the surrounding area. In 2018, the club registered around 1900 players in its tots (U5 and younger), intramural, travel, adult and TOPSoccer programs. Rose Tree is also committed to coaching education, hosting two U.S. Soccer Grassroots Courses last year and adding a third to the calendar for early 2019. Those courses help coaches obtain their National D License, the standard for all Rose Tree head coaches for travel soccer. 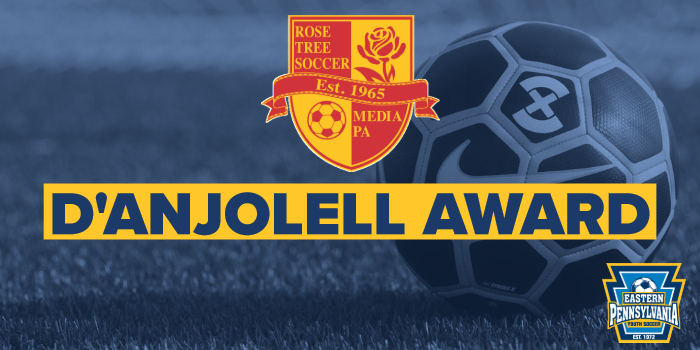 Named in honor of Betty and Ron D'Anjolell, two Eastern Pennsylvania Youth Soccer builders, the D'Anjolell award is presented to an outstanding Eastern Pennsylvania Youth Soccer club or league. The award recognizes that organization's contribution to the game and to the youth who play it.